GOOD RESULTS – ON THE UP! These days, the mail we receive each day, whether at home or at work, tends to be either junk mail or bills – not very exciting! 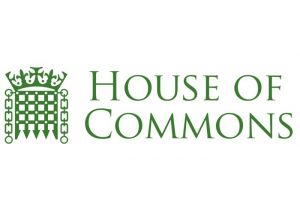 This morning was the exception to this when we received postal communication from the House of Commons. 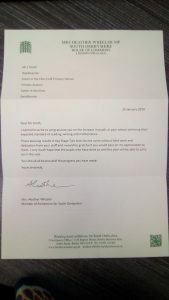 Our local MP for South Derbyshire, Mrs Heather Wheeler, has always been very supportive of our school; from attending our School Parliament polling days to giving talks to the children with the Rt Hon Chris Grayling, introducing politics to our children and highlighting the importance of the vote. Mrs Wheeler MP wrote to congratulate the school, it’s staff and pupils on the increase of pupils achieving the expected standard in the Key Stage Two tests; reading, writing and mathematics. We are incredibly proud of the progress we have made as a school, with results rising for the third year in a row and we strive to continually improve in all areas throughout our school moving forward. Previous Previous post: TABLE TENNIS CLIFFHANGER!